Kids scrape for remaining rice inside a pot at a displacement center in Beira, Mozambique, March 22, 2019. A man looks around from atop his house after Cyclone Idai in Buzi district outside Beira, Mozambique, March 22, 2019. "We are running out of time," she said. International aid efforts are coordinated by the World Food Program, or WFP. The agency's southern Africa director, Lola Castro, told VOA that relief groups are confronted with a "humongous logistics challenge" to help victims who are "extremely stressed." 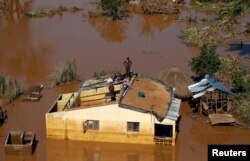 Castro said problems are compounded by the fact the stricken areas are located near the mouths of rivers. "Remember, these are deltas … and all these deltas are between salt- and freshwater." 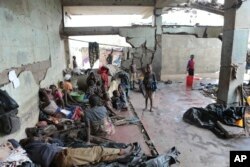 Survivors of Cyclone Idai wait in an abandoned and derelict building near Nhamatanda, about 50 kilometers from Beira, in Mozambique, March, 22, 2019. She said the tidal waves created by Idai may have salinized area waters, adding, "People are drinking this." U.N. Secretary-General Antonio Guterres said Friday that the U.N. and its humanitarian partners are "scaling up the response with the initial funding from generous donors." He said the U.N. has already released $20 million, but added, "Far greater international support is needed." The WFP's Castro said a "huge" humanitarian response is just the beginning. "The [Mozambique] government is going to need a lot of support on this, and the international community will have to look into a very long-term" humanitarian relief campaign, she said.